Model KLMDA shown assembled with Model DBLOM, Precision Magnetic Manipulator, along with Model ALMCS, Motion Control Box and Joystick. 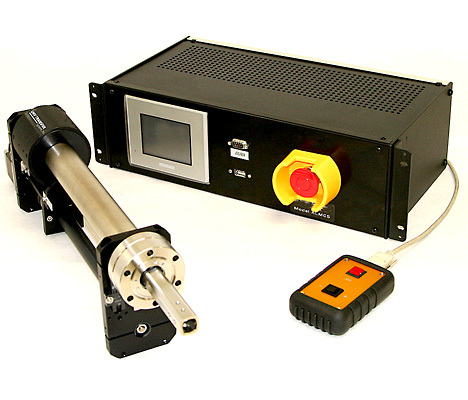 Models KLMDA and MAMDR extend the range of applications for the UHV Transfer Systems Precision Magnetic Manipulator (PMM) by allowing remote operation and computer control. These Mechanical Drive Assemblies and related components will work with the entire Transfer Engineering family of magnetically coupled linear, rotary and linear/rotary manipulators. 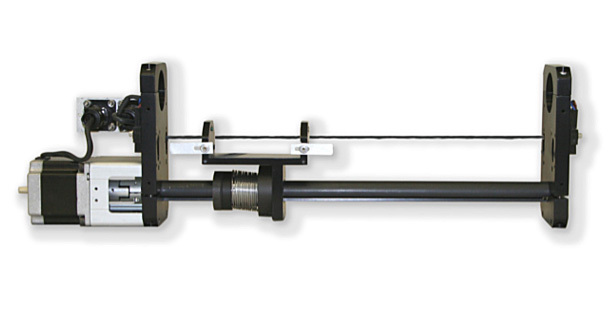 Remote operation when the magnetic manipulator is either very long or is inaccessibly mounted. Two versions of the Mechanical Drive Assembly are available. Model KLMDA is used to drive manipulators in the linear direction. Manipulators with linear and rotary motion or rotation-only use the Model MAMDR. Both models can be horizontally or vertically mounted. Options include limit switches, a pulley drive motor mount, an end motor mount (on spacers), a hand crank, a rotary drive attachment, a stepper motor and controller. Dependent on manipulator it drives. Model KLMDA shown with stepper motor attached.